Whistler, BC – Kranked opens flagship store in the majestic adrenaline playground of Whistler. The store is located in the heart of the Village Square next to Araxi's. Kranked founder Bjørn Enga, "It's awesome to be introducing the Kranked brand in this form to Whistler. 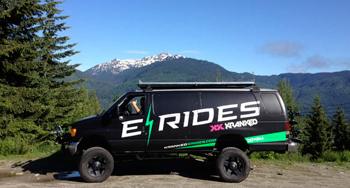 Kranked started in 1997 by introducing the world to free ride mountain biking in Whistler and is now introducing this amazing electric assist mountain biking also here in Whistler. Being the first to offer high performance electric assist mountain bikes in Whistler is rad!" The KRANKED store is selling Santa Cruz bicycles custom outfitted with EGO Electric kits. These are perhaps the most high performance off road electric mountain bikes in the world. The store also gives KRANKED a pulpit to spread the message "Every Kid Deserves a Wicked Bike!" With this in mind KRANKED has some of its 20" Kranked Ripper frames and completes in the store ready to stoke out some of the many mini shredders in this town! The main purpose of the store though is to have the opportunity to get people out on these electric assist bikes and experience the amazing technology. KRANKED has always had the mission "To get people out in nature with a healthy dose of adrenaline!" With this in mind KRANKED Rides Electric Mountain bike tours pairs this technology with a way to experience it and get into pristine backcountry in a new solar powered, eco adrenaline way! Kranked RIDES cofounder Chris Rothe, "I am super excited to be bringing sustainable, solar powered eco-tourism to Whistler. We can access the pristine wilderness in a super fun, energizing way, with a no carbon footprint. It's the future!" Supporting the tours is the Kranked Van complete with a three panel solar array on the roof. The store has a modern mountain feel and look and was designed by Hinterland Designs, Riley McFerrin. Kranked established a name for itself in 1997 with the first of many award-winning Kranked mountain bike movies that helped launch the adrenaline-based free ride movement. Since 2008 Kranked has been developing itself as a brand with a mission to inspire more people to embrace the cool, conscious, adrenaline lifestyle that mountain biking represents. To achieve this goal they developed a line of entry-level mountain bikes, helmets, and other gear that are sold in one of Canada’s biggest retail chains. Now Kranked has created a brand-new category, high performance off road, electric assist mountain biking and is set to lead the charge! (pun intended).